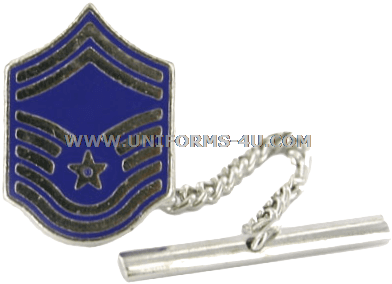 Two upward chevrons and five downward stripes form the rank insignia for Air Force Senior Master Sergeants (E-8) used in the design of this tasteful tie tack / tie clasp. 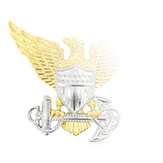 Tacks and clasps are an optional wear item on all Air Force uniforms that mandate (or permit) neckties and are worn centered between the very bottom of the tie and base of the knot. 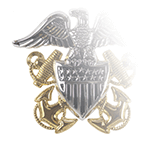 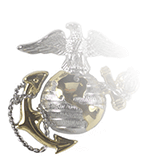 They may also be worn on civilian business attire. 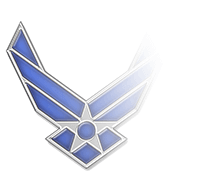 Authorized through the passage of Congressional legislation in 1958 that created the Enlisted pay grades of E-8 and E-9, the Air Force’s Senior Master Sergeants (SMSgts) are operational leaders who coordinate the needs of various organizations with the skills and resources of teams under their command. 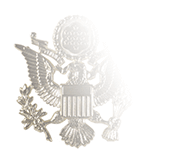 SMSgts continue to develop their leadership and managerial skills at the same they continue professional development through Professional Military Education courses offered by the Air Force as well as by sister services, ultimately attending and graduating from Senior Noncommissioned Officer Academy before they are eligible for promotion to Chief Master Sergeant.